1. 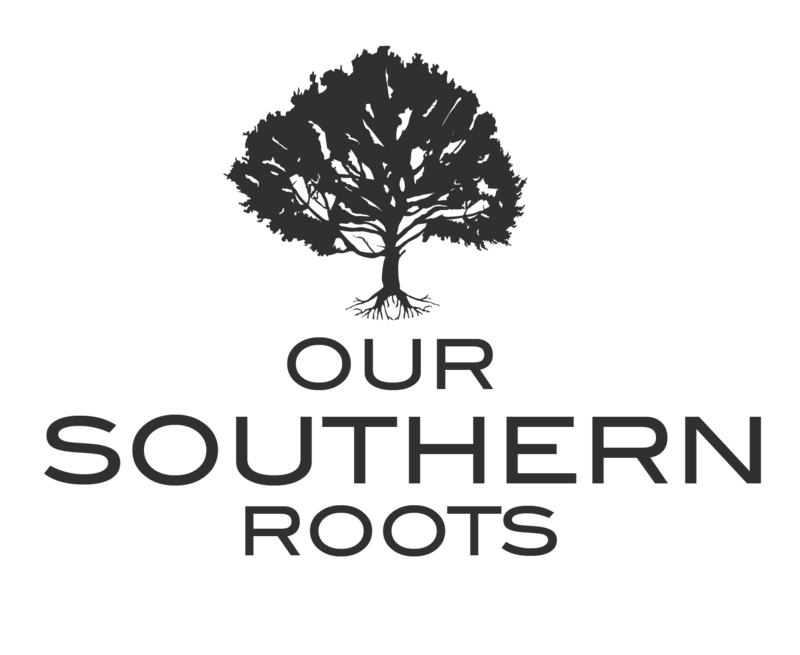 Scout - know where the turkeys roost, where they fly down and what part of the field the gobblers like to strut. I have observed that the Toms typically prefer to strut in an area that has short grass (or vegetation) and is elevated to give them a view of the entire field. On days that warm up quickly, I have noticed the gobblers will often move to a shaded part of the field. And if the weather is chilly and rainy, they will stay in the middle of the field longer. The hunter’s chances for success increase significantly when they are set-up where the gobbler naturally wants to go. 2. Decoys – use a decoy set-up that grabs the gobblers’ attention. 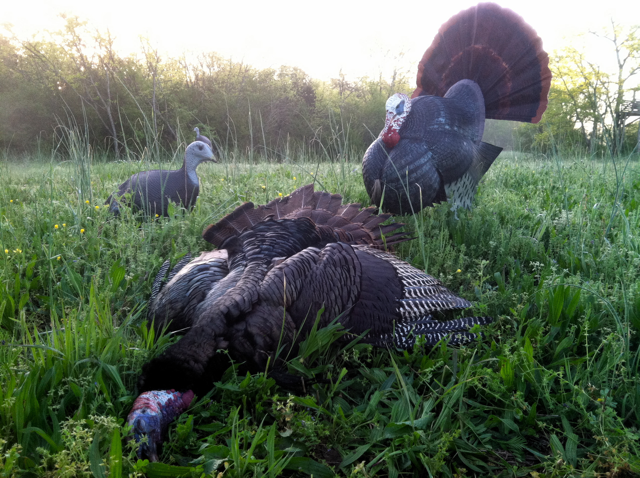 Most likely there will be other turkeys in the field… and it is difficult for decoys to compete with live hens. I have had great success using a strutting Tom and submissive hen breeding pair set-up (hen ready to breed position). However, I have also been successful using everything from a single hen to setting out a half-dozen decoys. If you recognize a decoy set-up is not working, don’t be afraid to make changes. For example, take down the strutting Tom and replace it with Jake decoy. Duck hunters adjust their decoy spreads as they see the ducks’ response to it…. turkey hunters need to do the same to be successful. 3. Calling – in big fields I try to be a little more aggressive in my calling than the “live hens.” I want to get the gobblers’ attention – and keep it! Calling is an art form rather than a science and there is no magical formula to follow. The hunter must make a decision in the moment, based on experience when to back off the calls and when to call more aggressively. 4. Set-up – if at all possible select a place to set up that puts you in the shade and provides decent cover. It is much more difficult to remain concealed when you are sitting in a spot with the sun shining directly on you. In big fields, there will typically be multiple turkeys approaching, which means multiple sets of eyes searching for the least little sign of danger. It doesn’t take much movement for a wise old Tom to become concerned and hang-up just out of range. 5. 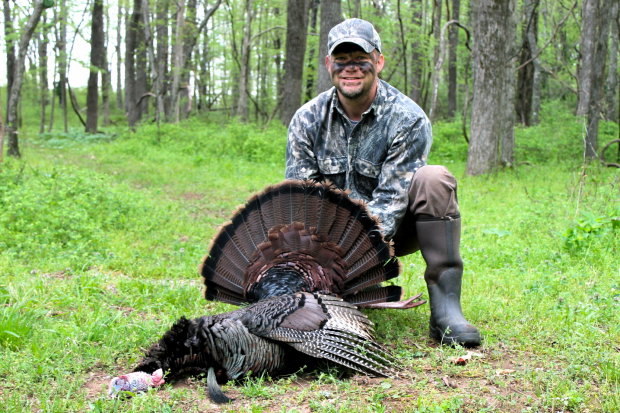 Change it up – if you are successful in shooting a gobbler in a big field, try not to “educate” the other turkeys. If possible, sit still after the shot until all the birds have left the field. The sound of the shotgun will disturb the turkeys, but they do not necessarily associate it with danger. The next time the field is hunted, change-up the decoy set-up and use different calls… the goal is to sound and look different. 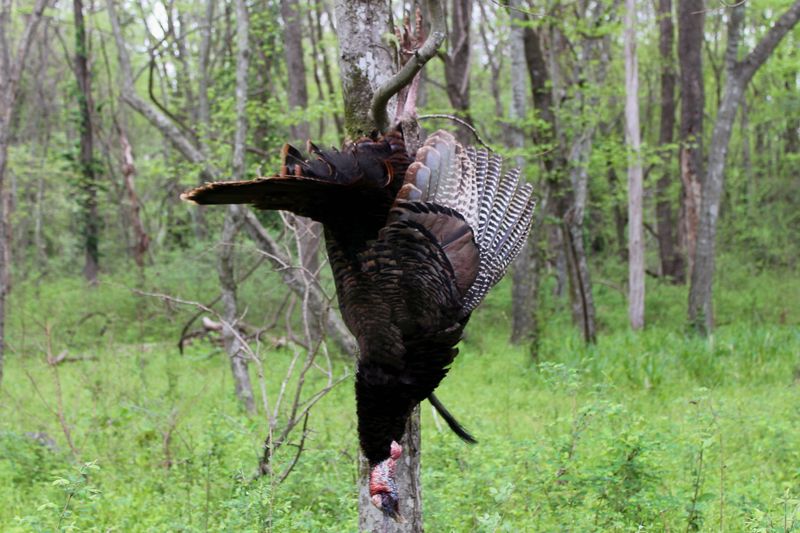 The Tom from the video is what turkey hunters refer to as a “limb hanger!” The gobbler’s spurs are long enough to hang him from a limb… it usually takes at least a three year-old bird to reach this status. Doesn’t always happen, but it’s great to be able to bust a turkey just after daylight and be backt home in time for breakfast with the kids! 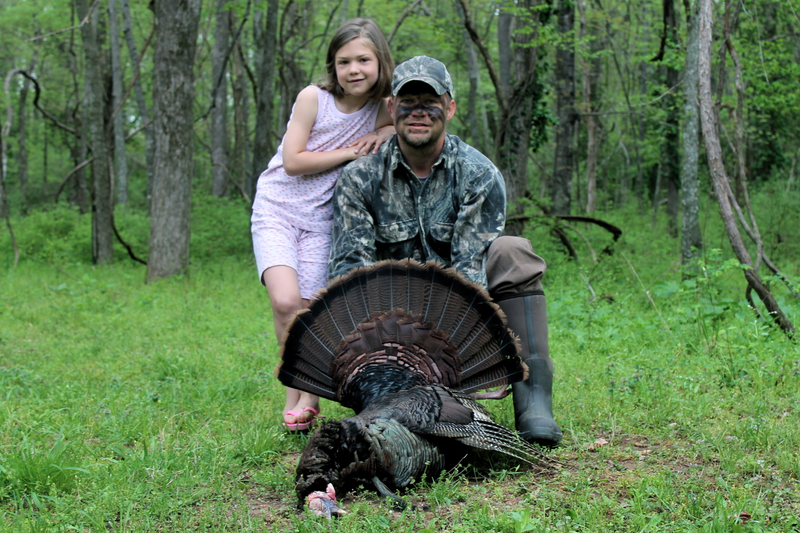 Having the kids share in the excitement of the hunt is special. I was able to take a second turkey from the same big field. I continued to use a strutting Tom and submissive hen set-up, but changed up the location and the calls. I found the tips very interesting and useful. I agree, involving the children in turkey hunting, or any type of hunting teaches them moral values and helps developing a deeper bond with them.